Mobile Devices: Is your organization protected from this newest threat? Mobile devices now represent the newest and largest vulnerability in corporate America. Employees are insisting they have these devices while the corporation has a responsibility to its shareholders to ensure that everything that is allowed to access the corporate network is secured. This means everything from the hardware, operating system or any application running on the device. Anything less is unacceptable. 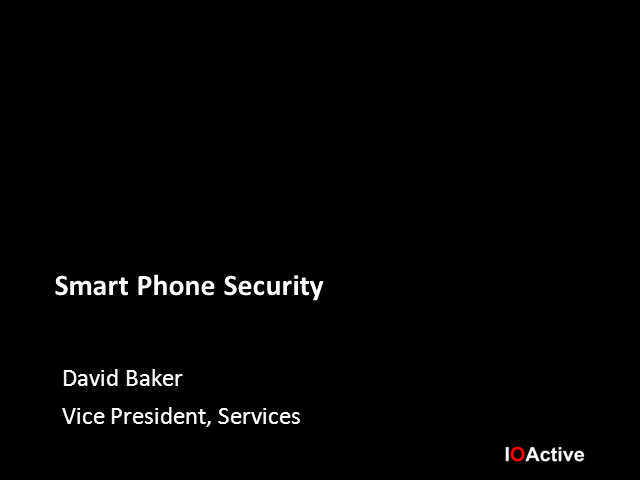 Have you developed a strategy to combat the security risks that iPhones, Androids, and Blackberry devices pose? - Strategies to ensure your organization is protected, today and in the future! Security Info You Can't Live Without! Join Ryan O'Horo, social engineering expert, as he explains what is inside the mind of a Social Engineer, and learn how easily people (in all types of workplaces) can be manipulated into willingly providing your organization's sensitive information to a complete stranger. We aim to provide information and best practices around security topics facing organizations today. We cover a variety of topics, including PCI compliance, application security, risk management, hacking, social engineering, SDL, SCADA and DNS. Each webcast lasts 30-60 minutes and the format differs slightly with each presentation. Topics presented are targeted at security, compliance and business professionals with an interest in risk management and information security. Title: Mobile Devices: Is your organization protected from this newest threat?